Since we home cooks only cook turkey a couple of times a year it’s hard to remember how long it takes to thaw and cook your turkey. Butterball is always your best source and this year they have added a special “Turkey App” to make sure your special Thanksgiving Day dinner isn’t a flop. Q: How long does it take to thaw a turkey? A: You have a few options when it comes to thawing a turkey. The Butterball site gives you a calculator to give you your options depending on how much time you have left. Q: How do you thaw a turkey in the refrigerator? A: Thaw breast side up, in an unopened wrapper on a tray in the fridge. Allow at least 1 day of thawing for every 4 lbs. Q: How do you thaw it in cold water? A: Thaw breast side down, in an unopened wrapper, with enough cold water to cover your turkey completely. A: The first step in the process is selecting your brine recipe. Next buy a fresh turkey to eliminate the need to thaw, or completely thaw a frozen turkey. Q: What can I make with all of the turkey leftovers? A: Most recipes that call for chicken can usually use turkey as a substitute. Turkey Sandwiches, Turkey Noodle Soup, and Turkey Pot Pie are the most popular options. Place turkey breast-side up on a flat rack in a shallow roasting pan 2 to 2½ inches deep. Turn the wings back to hold the neck skin in place. (Tucking the wings will help stabilize the turkey in the pan and when carving) Brush or spray skin lightly with vegetable or cooking oil or butter for best appearance and taste. Insert a meat thermometer deep into the lower part of the thigh without touching the bone. When the thigh is up to temperature, and if the turkey is stuffed, move the thermometer to the center of the stuffing. 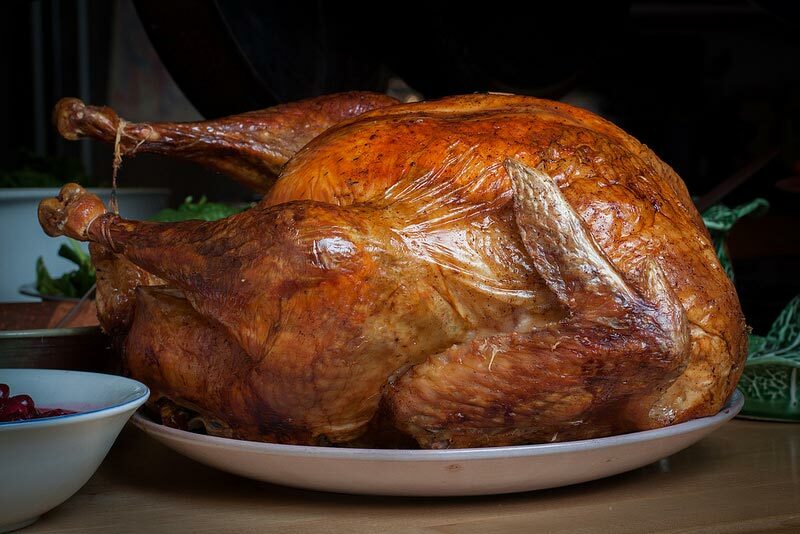 Your turkey is done when the temperature with a meat thermometer is 180° F in the thigh and 165° F in breast or stuffing. Lift turkey onto a platter, and let stand for 15 minutes before carving. 4½-7 lbs. 2-2½ hrs. 2¼-2¾ hrs. 7-9 lbs. 2½-3 hrs. 2¾-4½ hrs. 9-18 lbs. 3-3½ hrs. 3¾-4½ hrs. 18-22 lbs. 3½-4 hrs. 4½-5 hrs. 22-24 lbs. 4-4½ hrs. 5-5½ hrs. 24-30 lbs. 4½-5 hrs. 5½-6¼ hrs.